We are a group of very concerned citizens who reside in Florida. Our health, environmental and political network is deep and wide across the entire state. All of us worked arduously to elect you in 2016 by helping to secure the often decisive 29 electoral votes of Florida. Now to the essential point of this open letter: the 5G roll-out must be shut down. Your advisors also know that a 5G roll-out nationwide will produce — by far — the single greatest public health disaster in U.S. history. Because of these stark realities, all of us are quite concerned about your completely unjustifiable enthusiasm for the extraordinarily perilous 5G project. That you even look forward to a future 6G roll-out is even more alarming. Perhaps you ought to read the following exposé for further edification on this exceedingly weighty matter. Now to the real point of what is essentially our “Demand Letter” to you, only we have cut out the attorneys. If you do not terminate — POST-HASTE — the rapidly intensifying 5G rollout in Florida and elsewhere, our extensive network and other partner groups will closely collaborate to ensure that YOU WILL NOT CARRY FLORIDA in 2020. Were we to initiate a statewide campaign to guarantee your defeat in Florida, you simply will not receive the necessary 29 electoral votes. And everyone knows that whoever takes Florida wins the POTUS election. Perhaps a third-party candidate will emerge who really cares about the health and welfare of the American people. KEY FACT: In many communities throughout Florida, many of our healthcare practitioners know that the day they flip the switch on 5G, many folks with Electro-hypersensitivity syndrome will either die slow deaths or be severely debilitated for the rest of their lives. Of course, the young and the elderly, the weak and the sick, as well as those who have regular exposure to both the 5G electro-magnetic frequencies and microwave radiation will likewise experience serious forms of ill health. Please be aware that we have ample time to conduct this awareness-raising campaign between now and Election Day. And, that your candidacy will only diminish as the electorate comes to apprehend your inexplicable apathy toward their physical safety and well-being. While we are equally concerned about the rest of the nation, we strongly feel that a people-powered success here in Florida can serve as a model of anti-5G advocacy for the other 49 states. So, yes, our real request is that you shut down the 5G roll-out nationwide, not just here in the Sunshine State. President Trump, the choice is clearly yours: Either you immediately stop the deployment of 5G, or you will suffer an electoral loss in Florida on November 3, 2020. One last crucial point: we have no intention of helping a Democrat win 2020; that treasonous political party has proven to be an extension of the Communist Party USA. However, you have left us with no choice since the 5G rollout will endanger the American people like nothing ever before. The inevitable death and destruction to both people and planet are inconceivable. So what would be the point of supporting a second Trump administration if we’re all toast—LITERALLY?! We will end this letter with a question aimed directly at you, Mr. President: Why is 5G not even allowed in Israel where it was developed? Truly, with the introduction of 5G throughout the United States and beyond, the fate of humanity hangs in the balance … as does the viability of the entire Biosphere. P.S. 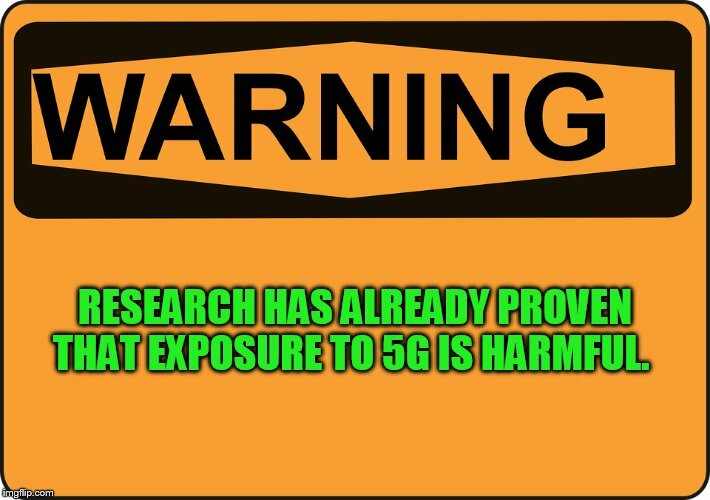 In case you are not aware, the deployment of 5G has many other hidden, and even more deadly, aspects which very few folks are aware of. Therefore, we highly recommend that you watch the following video to understand the real intentions behind this highly precarious technology paradigm. *Who are the “Concerned Residents of Florida Against 5G”? Some of us Conservatives, Christians, Tea Partiers, Libertarians, Republicans, Independents and/or Walk-away Democrats; but we are all Patriots and Nationalists. We are health advocates, environmental activists, political reformers, small business owners, corporate employees, government service workers, doctors, attorneys, professors, scientists, elected representatives, lobbyists, accountants, blog-writers, Internet crackerjacks, Alt Media journalists and MSM reporters, among many other occupations. We live in Miami, Tampa-St. Pete, Orlando, Jacksonville, Clearwater, Pensacola, Tallahassee, Gainesville, Sarasota, West Palm Beach, Boca Raton, Fort Lauderdale, Daytona, Vero Beach, Jupiter, Fort Meyers, Naples, Panama City, Destin, St. Augustine, Melbourne, Port Saint Lucie, St. George Island, the Keys and everywhere in between. And we ALL take this urgent endeavor very seriously! Furthermore, we began to organize on the very day that this SOTN news bulletin was posted: “EVERYTHING CHANGES WITH 5G”. Every patriot in the Truth Movement is encouraged to disseminate this SOS far and wide. It’s no longer about Right and Left; it’s now about LIFE and DEATH for every U.S. citizen. Most importantly, be sure to send this letter to President Trump and his family. Many Alt Right media platform will likely be unhappy with this post. Please, don’t complain to SOTN, write to the POTUS. We’re in this predicament only because of the President’s lack of appropriate response to 5G; hence, only Trump can fix it fast. Tweet this post to his attention so he knows his re-election bid has been significantly affected by this highly consequential issue.